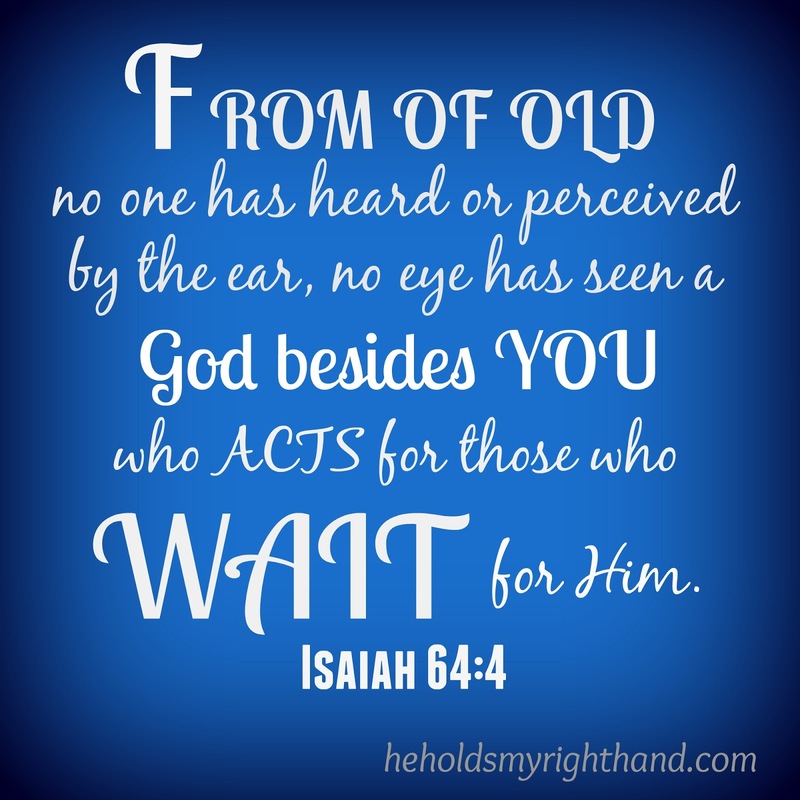 He Holds My Right Hand: What Does it Mean to Wait for the Lord? The word of the week is WAIT. It is a short word with a big command. It is one of the hardest things we have to endure, because we are impatient people. It is something EVERYONE (including my family) is doing right now, every day, in some way, for something. What exactly does it mean to wait? It means to stay where you are until it’s the right time for something to happen. Psalm 31:24 - Be strong, and let your heart take courage, all you who wait for the LORD! Psalm 33:20 - Our soul waits for the LORD; he is our help and our shield. Psalm 37:7 - Be still before the LORD and wait patiently for him; fret not yourself over the one who prospers in his way, over the man who carries out evil devices! Isaiah 40:31 - but they who wait for the LORD shall renew their strength; they shall mount up with wings like eagles; they shall run and not be weary; they shall walk and not faint. Lamentations 3:25 - The LORD is good to those who wait for him, to the soul who seeks him. Micah 7:7 - But as for me, I will look to the LORD; I will wait for the God of my salvation; my God will hear me. Proverbs 20:22 - Do not say, “I will repay evil”; wait for the LORD, and he will deliver you. 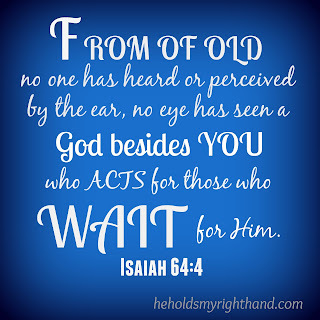 What does it mean to wait for the Lord? It means to stay where you are (i.e. remain faithful) until the right time (God’s time) for something to happen. It means to expect and hope for the best to happen; for God to intervene in your situation. FOR THOSE WHO WAIT FOR HIM: for those of us who remain faithful as we expect and hope for God to intervene on our behalf, when the time is right. Since the beginning of the world, not one single person in the history of time has become aware of, by listening with the ears, or visually recognizing, a God other than Elohim (the Creator and Ruler of the world) who takes action (works) for those of us who remain faithful as we expect and hope for Him to intervene on our behalf, when the time is right. In summary, the God of Heaven and Earth, the Maker of the universe, is actively working FOR us. Why? Because He cares about us, and knows what is best for us. We can’t see the future, but He can. So, we need to trust and patiently wait for Him to work on our behalf. Sometimes, things turn out differently that what we envision, but oftentimes, they turn out even better. Keep hoping, keep trusting, keep waiting for the Lord. It will all work out in His time.